Instagram has always been the best visual platform, but it's so much more than that! Did you know you can now use Instagram as an income-generator to sell your products? With a little bit of know-how on the front end, your Instagram account can also become a top selling tool. 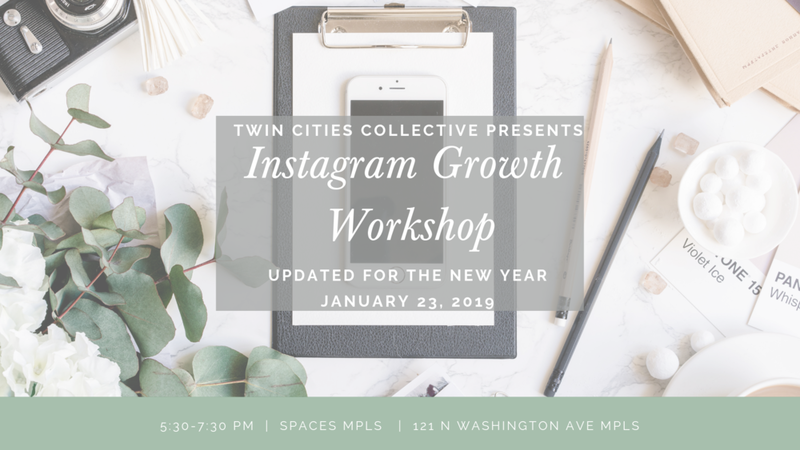 Jenna Redfield of Twin Cities Collective has tailored her popular Instagram Growth session just for our makers to focus on product-based businesses and how to sell through Instagram. Makers, artists, and small business owners with product-based businesses (as opposed to service providers) who manage their own social media presence. Tickets for this session are $40. Light snacks are provided. A cash bar will be available. Hi everyone! My name is Jenna Redfield and I run the Twin Cities Collective. I grew up here in the cities then went to college to become a video editor & get my Communications degree. I started my first business doing wedding videography then transitioned into freelance video editing. Along with that, I launched a styled stock photography shop originally called "JennaRedfieldCreative" where I styled product photos that people could purchase to use in their marketing and social media. Over time, I've transitioned that to this brand & now I am a social media (specifically instagram) strategist here at TCC, working with small businesses to create content for their social media & connect them to the right people! Along with that I was a local Minnesota blogger. I started attending blogger events, including one called Twin Cities Blogger Collective. When I heard that the leader was moving, I saw an opportunity to be a part of something bigger - so I asked her if I could be the new leader! Since then we’ve completely rebranded, including a leap from just bloggers to other amazing locals, including creatives, entrepreneurs, small businesses and makers! During the rebrand we changed our name to Twin Cities Collective, got a new website, grew the Instagram & Facebook group, launched our podcast & workshops, as well as many other events to spread our name and our purpose to the Twin Cities community. Come join us for brunch at the Bird in Loring park! We will have a private room available for everyone! This event is free but brunch is up to you. Parking is available on that street or in the paid parking lot in the back! We are excited to be presenting our first ever Pinterest Workshop on October 25th with special guest Laura Rike! Tickets to the TCC Potluck Party are here! Twin Cities Collective Party! 100 Tickets up for grabs! Our first series of workshops for 2018. Learn how to grow your instagram & the tools you need! Info about the Media Kit workshop! With our 2 hour DIY podcast session, you will be set and ready to go to launch your successful podcast! Come take a fitness class at ALTR & hang out with us after! Minny Spoons Co. nut butters will be available for tasting & we will have a few giveaways! Curious about working with bloggers & influencers but don't know where to start? Come meet the largest influencer & blogger community in Minnesota, the Twin Cities Collective! Learn more about how microinfluencers can use their influence bring in traffic, followers & sales to your business, without having to build a following of your own! Being a blogger or creative can be fulfilling, but sometimes we all need to get out of the house already. Two bloggers met for breakfast and had such a good time, we decided to invite you along. Do you have an idea for a collaboration you've been mulling? Are you looking for help with a certain creative task? Want to just give your cat some space and hear what other bloggers are up to? Join Laura from One Girl, Two Cities for a casual conversation and exchange of ideas. Join the facebook group for the link! This month is all about branding & web design so I'm super pumped to be having 4 web designers and branding experts join me to talk about websites and why they are so important for building a brand! The location is tentative and may change during the next 2 weeks. The Women's Small Business Expo is the first in a series of many that will showcase local businesses owned by women within the Twin Cities. Entrepreneurs across the Minnesota Metro will come together to display their arts, crafts, handmade clothing, handmade jewelry, beauty and body supplies, spa and healthcare services, and much more. New salon on 38th and Bloomington Ave S, Mpls. *** Color expert and decorative painter Annie Sloan will teach free, hands-on workshops using Chalk Paint® and sign copies of her 26th book, “Annie Sloan Paints Everything” *** Flea Market Style mag editors Ki Nassauer and Celeste Shaw will sign copies of the Spring issue *** KSTP-TV home and garden expert Larry Pfarr will demonstrate how to incorporate vintage items into Spring tabletop and home decor *** All day Friday, attendees can register to win $25 cash tokens they can redeem for merchandise in the booth of any Junk Bonanza vendor. THURSDAY 10AM-5PM (Early Birds come in at 8AM) FRIDAY and SATURDAY 9AM-5PM $10.00 general admission at the door. $25.00 Early Bird online (good for 8AM admission opening day and regular admission Friday and Saturday, too). Early Bird $30.00 at the door. You are invited to join hundreds of women entrepreneurs for the 4th annual Women in Entrepreneurship Conference hosted by WE*. This year, it's all about the customer and how to keep them at the heart of your business throughout the value chain. The half day seminar will feature successful entrepreneurs and professionals sharing personal success stories and lessons learned related to product testing, user experience, manufacturing, retail and marketing.